This is the coolest Mac poster....Ever! "OK OK. You can use my name as long as you mention my book. Now quit calling me!" Jef passed away in February of 2005 at the age of 61. Jef was always a good sport, so I'm leaving the quote we agreed would be fun. "Clearly the finest Mac poster you will ever see...through." "Nobody will ever need more than 640K of RAM." And Steve Jobs has been too overwhelmed to even comment! 18 by 24.75 inch poster of the clear Mac SE prototype in exquisite detail. This slightly larger than life-size image is printed on 100 lb. Luna Gloss book weight paper with rich color and detail so fine you can clearly see the individual dots in the Mac screen desktop pattern. 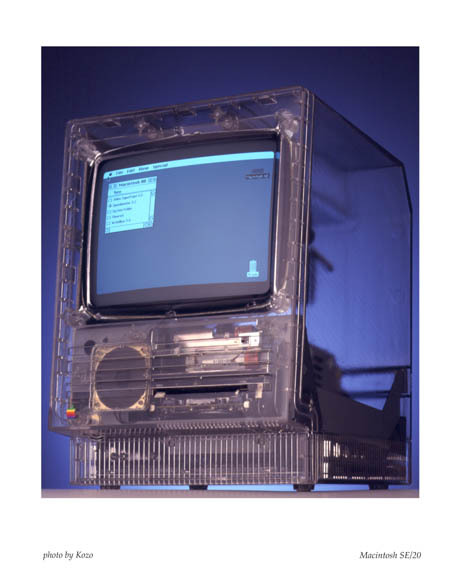 The only color on the clear housing is found in the Apple logo on the lower left. The legend is printed low on the border so that it can be trimmed or covered by matte for framing. When ordering by check or money order, up to four posters can be shipped with one shipping fee (four to a mailing tube). Be sure to include your mailing address and an email address so we can notify you when your poster is sent. For detail on the Mac in the poster, see this description.